Drones have literally taken off in the last few years. But when it comes to buying one, there’s a lot to consider. First off, you’ll have to decide what your primary needs are for it. Are you just starting out and looking for a beginners’ model? Do you just want a cheap model to play around with? Or do you want to use it to take aerial pictures and video? To help you decide which drone might be best for you, read our top picks below (and before you use it, be sure to read about the rules and regulations on the FAA website). DJI’s Mavic Pro can be summed up in three words: portable and powerful. Capable of collapsing down to as small as a bottle of water, DJI Mavic Pro is a fantastic choice for quadcopter fans. A new OcuSync transmission system will offer up to 4.3 miles of range, 40 mph speed and a flight time around 27 minutes, thanks to a powerful battery. The lengthy range away from the base controller is aided by GPS and satellite to help maintain precise location control. Thanks to sensor redundancy, the inclusion of obstacle avoidance will help the Mavic Pro dodge anything that could knock it out of the sky. 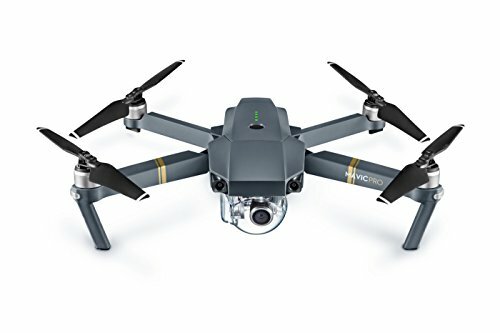 Visually, the 3.27 x 7.8 x 3.27-inch Mavic Pro looks and feels different from DJI’s wildly popular existing quadcopter line and has more contour and angular shapes. It almost gives off the appeal of a stealth bomber, rather than the stark white Phantom line. Shorter legs give the Mavic Pro the appearance of landing on its belly, and the rear arms pivot downward to tuck in the underside while the front arms fold inward toward the top of the main body. Recreating the camera and three-axis gimbal system allows DJI’s designers to create such a backpack-friendly design. Setup is a snap and, after connecting to the remote control, you can add a smartphone to act as a screen. The compact remote is as well designed as the Mavic Pro itself, with two joysticks controlling height, direction and motion. One scroll wheel on the back adjusts the camera gimbal and the other is open to programming. The camera records 4K video at 30fps or 1080p at 96fps, the latter of which can live stream to Facebook, YouTube, and Periscope at 30fps. Additionally, you can capture stills with the 12-megapixel camera.